I’m one of those who never shave their legs unless I have to. I much rather be hairy then going through the pain, expenses, and time of hair removal. With an very important formal function coming up, I needed to look for options. Shaving was not acceptable, I’ve touched ladies with leg stubbles, NOT AN OPTION! I also had used the drugstore brand hair softening cream, chemicals, also NOT AN OPTION. And that left me with waxing. A visit to my local natural food store which has a very strict standard when choosing what they sell yielled the Parissa brand. Parissa products are non-toxic, parabens/preservatives free, all natural, and not tested on animal. The ones I got (summer, 2015) was made in Spain. While I researched for the pain level, I only found one video that said it hurt. Eventually, I found this video by Effortless Ruth that convinced me to get it. I think the person who said it hurt might not have followed the instructions well. I read the instructions, watched Ruth’s and Parissa’s video, then in less than 5 minutes I have hairless legs! No Pain, no mess. 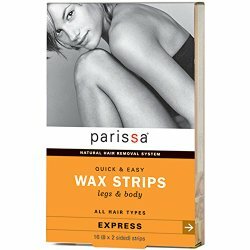 I’ll never dread waxing my legs again! This entry was posted in I Found This and tagged home hair removal, painless hair waxing, parissa, shaving legs by n2n. Bookmark the permalink.